Halloween Special: Free Short Story Collection! 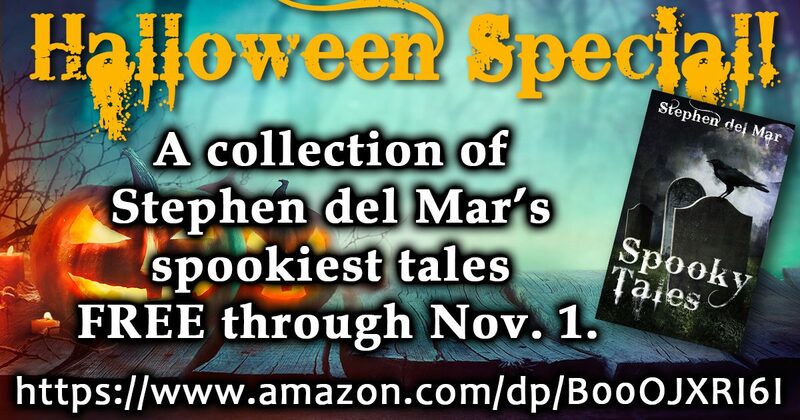 My Spooky Tales collection of five short stories is free on Amazon until Nov. 1. A haunted house, ghosts, a grandmother, and zombie pirates! “The Demise of Bobby and Clyde” is an old fashion haunted house story. Bobby and Clyde are on the run after a bank robbery, unfortunately they decided to wait out a hurricane in a very creepy old house. “The Broken Heart” is about Zach. He lost his lover and is trying to move on. He’s retired down to Florida and is restoring an old boat he found out in the swamp. On his trip down river he meets some mysterious folk that might help his heart mend. “HIM” is a short psychosexual horror story about madness, delusion and murder. Imagine taking the bus home at the end of a cold winter day. The bus is full of all kinds of people with all kinds of problems. And as one slowly descends into madness he notices you. Would you notice before it is too late? Intended for mature readers only. “Day of the Dead” is a story about Mateo and Alex building their relationship and overcoming cultural differences. Fortunately Mateo’s grandmother is there to help or is she? “A Night on Blood Isle” is a short tale about a pirate island off the coast of Bennett Bay. Not the kind of place you want to get caught in the fog. Free: “HIM,” a short psychosexual horror story.